Available are two options of the T2 UFH Heat pump Control Group, either a pre-assembled Control Group including a Class A Wilo Yonos Para pump or as parts only, non assembled kit without pump. Both options include an automatic differential pressure by-pass valve and three isolating valves for use with 1” T2 manifolds and a low temperature heat source, typically a Heat Pump. Pre-assembled Control Group with built-in Wilo Yonos Para 25/6-RKA class A circulating pump, 28mm compression inlet connections and 1”MBSP swivel connections for direct connection to Emmeti Topway T2 manifolds at 210mm centres. The Control Group can be reconfigured to allow the pump to be positioned in the lower arm of the Control Group. Includes isolating valves for both the manifold and the circulating pump, an automatic differential pressure by-pass valve between the inlet flow and return connections, to allow balancing of the inlet circulating pressure. 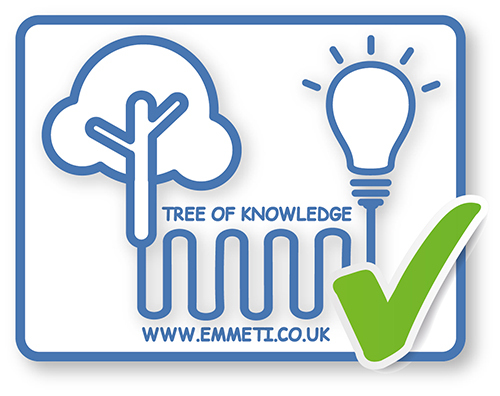 Compatible with Emmeti T2 manifolds for underfloor or radiator heating from 2 to 12 ways. How do I know what the temperature the water is when entering the control group? This unit is designed to be used where you have a low temperature heat source (like a heat pump) that has a verifiable flow output temperature. A verifiable return temperature is an asset. How do I set the pump flow? The pump we offer can be set to automatically adjust flow to match resistance, or can be set to a fixed flow using the instructions that are supplied. How do I set the temperature coming in to the underfloor? This is set at the heat source, typically a heat pump. Usually, this will be higher than the temperature required for your underfloor heating, as there will be some heat loss, the amount of heat lossi s dependent on how far away the manifold supplying the UFH circuit is from the heat source. How do I set the differential by pass valve on the T2 UFH Heat Pump? Why do I need the more expensive Class A pump? In order to maximise circulating pump efficiency we now offer the Wilo Yonos Para RS25/6 - RKA. This incorporates a high efficiency permanent magnet motor and powerful electronics which both help to reduce energy consumption and also protect the motor in use. The Wilo Yonos Para more than meets the requirements of the Energy using Products directive (EuP). Its Energy Efficiency Index rating of 0.2 is clearly ahead of the requirement of 0.23 by 2015. Can I isolate the manifold? Yes, as the T2 Heat Pump control group includes two isolating ball valves, located just before the manifold connections with red and blue handled butterfly handles and a three port diverting ball valve fitted just before the pump. These enable you to isolate the manifold for maintenance and commissioning. Can I isolate the T2 Heat Pump control group? Yes as the T2 Heat Pump control group includes two isolating ball valves, located just before the manifold connections with red and blue handled butterfly handles and a three port diverting ball valve fitted just before the pump. This allows for isolation of the pump for repair or replacement and isolation of the control group and manifold with the bypass operating directly from primary flow to return. How do I reduce incoming high pressure?